The electronically controlled, high-pressure, common-rail diesel fuel systems of today render most owners lost when attempting to comprehend just what occurs under the hood. Cutting to the chase, not knowing what is and what is not considered normal operation of the Duramax can fuel owner paranoia and bring one to the misconceived notion that a new (and expensive) batch of fuel injectors are needed when, in fact, they are not. It has not helped that GM historically has demonstrated the inability to produce a reliable diesel fuel injection system. Check that – its first foray into electronically controlled diesel injection pumps on the 6.5 turbo diesel marked that engine forever as unreliable and cantankerous despite the resourceful owners and technicians that have dug in and found reasonable solutions to make the 6.5 more reliable. I still deal with people from the other diesel camps – the Cummins and Powerstoke faithful – who believe that the Duramax is merely a refreshed version of the 6.5 with all its failings: failings that are naturally exaggerated by those who have a prejudice against the General. The common notion that the 6.5 turbo diesel has an unreliable fuel system tainted the Duramax somewhat, especially at the start. ...and then the fuel injector debacle began to unfold. My article in the Spring 2008 issue of maxxTORQUE deals at length with the problems of and solutions to that very well known rash of fuel injector failures in the early days of the Duramax. If you have not read that article, it is well worth your time to go back and get educated on what really was going on at that time. Still, owners tainted by those early problems or rumors of fuel injector failures can have inordinate fears even though real solutions have been implemented. This brings us to the purpose of this and subsequent articles: to help owners understand the inner workings of their Duramax diesel fuel system. This article will cover the fundamentals of the Duramax common-rail diesel fuel injection system, its components and their normal operation. In a future article, I will look in more detail at the brains of the operation – the Engine Control Module, sensors and control of the fuel system. Future articles will cover diagnosis and repair in more detail for the more adventurous, using tools like EFILive and HPTuners as well as readily available hand-held generic scan tools. This article will arm the average Duramax owner with enough knowledge to begin to understand the normal operation of the fuel system. It is generic enough to cover all Duramax engines, although it should be noted that there are several detailed differences between the LB7, LLY, LBZ and LMM fuel and engine management systems. I will cover each of the major fuel system components, their operation and various common service issues related to each component. 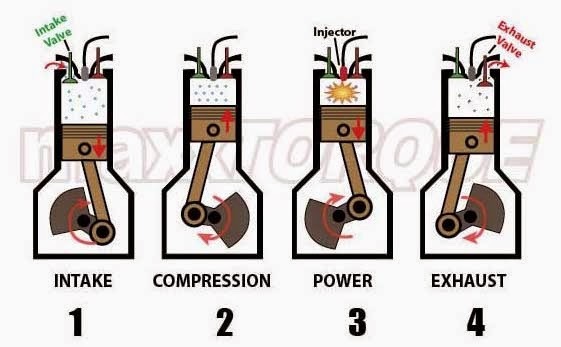 To get started, let’s review some points of basic diesel engine operation. They use much higher compression ratios in order to heat atmospheric gasses to a temperature at which they will spontaneously ignite a fuel source, in this case, diesel fuel. As the diesel fuel is directly injected, it only atomizes – or mixes – with the atmospheric gasses that are local to the injector and it then spontaneously combusts without any spark required. This eliminates the need to manage a constant fuel/air ratio as required by gasoline engines. In the diesel, the remaining uncombusted air charge in the cylinder absorbs the heat from combustion, expands and helps drive the piston down the cylinder. With a few exceptions, diesel engines do not use a throttle valve assembly. Diesel engines take in as much air as their volumetric efficiency allows. Due to the direct fuel injection process, there is no need to regulate, or throttle, incoming air. This design eliminates pumping losses” that are common to gasoline engines trying to draw air across a throttle plate and makes the diesel inherently more efficient. A diesel engine’s power output is regulated by the fuel quantity, not the air quantity. More fuel equals more output. A gasoline engine manages both fuel and air quantity to regulate output because it has to maintain a constant fuel/air ratio. A diesel engine does not need to run with a constant fuel/air ratio. Therefore a diesel engine does not run rich or lean in the same manner as a gasoline engine. With a diesel engine, it is possible to introduce more fuel than the air required to fully consume the fuel. Black smoke commonly results. Because the fuel starts to burn as it is injected into the superheated air in the combustion chamber, fuel injection must be precisely timed and controlled. Traditional diesel fuel injection systems used a distributor pump that delivers high-pressure fuel to a simple spring-seat injector at the right time for injection. The Duramax uses a common-rail system, where high fuel pressure is always available to an electronically controlled fuel injector and it is the injector itself that controls the fuel that is delivered to the combustion chamber. The LB7 Duramax diesel fuel system was the first time we saw Bosch common-rail, high-pressure diesel injection in a North American product. Bosch had already been building these systems for Mercedes Benz, so we benefited from proven technology. 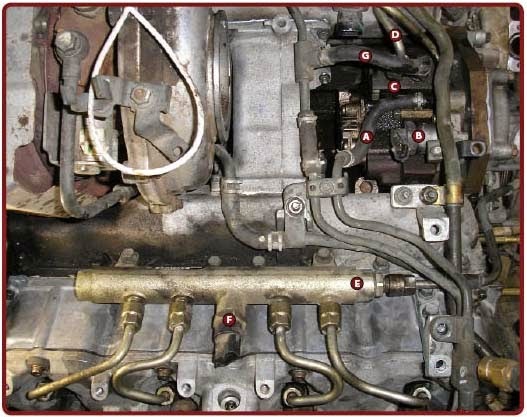 The most commonly noted feature of the LB7 fuel system is the fact that the fuel injectors were located underneath the valve covers, placing them inside an environment where a fuel leak would fill the engine oil with diesel fuel. Maximum fuel pressure for this fuel system was 23,200 PSI, a dramatic step up from the earlier distributed, direct-injection diesel fuel systems. Pilot injection, a new injection strategy that will be discussed in further detail later, was also introduced. During the middle of the 2004 model year, the LLY Duramax advanced fuel system technology somewhat by using more robust injectors. The big plus was that the injectors were now mounted outside the engine. Fuel leaks would not cause oil contamination at all. This was important because the LLY now had a positive crankcase ventilation system. If diesel fuel was allowed into the crankcase, the engine could end up ingesting the excess fuel through the crankcase ventilation system, causing a runaway condition. These injectors also turned out to be slightly more serviceable outside the valve covers, although placing them in an external environment did make them more difficult to deal with in some situations due to debris and corrosion. In 2006, first the LLY and then the LBZ were recipients of a significantly redesigned fuel injector. These were much faster, capable of five injection events per stroke and allowed for pilot injection throughout the engine’s revolutions range. They had a higher maximum operating pressure (26,500 PSI), allowed emissions to improve and diminished noise even further. The 2006 Duramax is notably smoother and quieter than prior generations. This type of injector was carried over to the 2007 LMM Duramax and continues to be used until middle 2010, when we will hopefully see the introduction of the LML Duramax with yet faster and more precise piezo-style injectors. With that brief history we will now look at the various components of the Duramax fuel system. The journey starts at the fuel tank. Unlike the galvanized steel fuel tanks of the past, the Duramax has a high density polyethylene fuel tank which makes it impossible for corrosion to cause leaks. 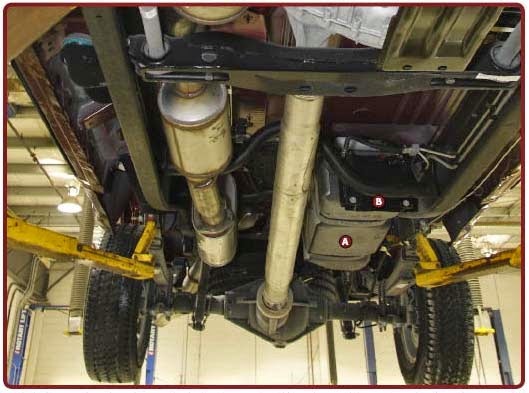 It is located on the driver’s side, inside the frame rail and in front of the rear axle. Important to any fuel tank is its venting system. On the Duramax, the tank is vented via the fuel cap. If the fuel cap vent is restricted or replaced with a non-venting cap and the engine is run a vacuum is created that can be powerful enough to collapse the fuel tank. It usually takes around 30 minutes of engine operation for a tank to start to collapse due to a plugged vent, depending on ambient conditions. The fuel pickup and sender module is located in the middle of the fuel tank and is accessed from the top. The fuel pickup consists of a simple strainer; there is no lift pump in the tank of any kind. In fact, there is no electric lift pump in the Duramax diesel fuel system. Fuel transfer from the tank is handled by a supply pump contained within the injection pump assembly. The fuel level sensor is a simple float device which returns an electronic signal with the fuel level to the Engine Control Module (ECM). Fuel returned to the tank from the fuel injection system is also returned to the tank at the fuel pickup module. In the 3500 series chassis-cabs, a dual fuel tank system is generally provided. This dual tank system is entirely controlled by the ECM. GM simply adds a secondary fuel tank located behind the rear axle to feed the existing primary fuel tank. Fuel tank capacity is effectively increased from the 36 gallons provided in the long-box tank to 50 gallons divided over the duel tank setup. The engine receives its fuel from the fuel pickup in the primary tank only. As the main tank’s fuel level drops, the ECM will energize a transfer pump that pumps fuel from the secondary tank into the primary tank. The ECM will attempt to keep the levels in both tanks approximately the same. Fuel Tank (A) and Fuel Cooler (B) – the fuel cooler is vulnerable to foreign debris and can be plugged. It is good to periodically check it's condition, located just in front of the fuel tank. A couple of issues can arise when aftermarket fuel tanks are plumbed into the factory fuel filler. If the aftermarket tank is situated above the factory fuel tank and allowed to gravity feed, it can sometimes cause the fuel filler cap to leak through its vent. Also, if the truck is driven continuously for long enough without the fuel level in the factory tank dropping, the ECM can set a trouble code for the fuel level sensor, usually a P0461. The ECM expects the fuel level sensor to drop over a certain distance. If a fuel level sensor DTC sets, the fuel gauge will default to always showing low fuel. In a perfect world, the dual tank system would work fine but they have proven to be very cantankerous. An ECM programming update from GM addresses most of the issues; however, the biggest service issue that we still deal with results from operators neglecting to shut down the engine while fueling. While it may be illegal and unsafe, many people in cold climates fuel their trucks with the engine running. When the active ECM sees one fuel sender rising with the addition of fuel, it can get confused, set a DTC and shut down the fuel transfer system and fuel gauge. As a result, the truck will run off the fuel in the primary fuel tank only and the driver will be left with no indication of how much fuel is in left in the tank. Following the path from the fuel tank to the engine, the first component that the fuel arrives at is the Fuel Injection Control Module (FICM). The FICM is located on a mounting bracket on the front passenger side of the engine. The fuel’s only function here is to cool the FICM, since the module builds up considerable heat during operation. The FICM also has the effect of pre-warming the fuel in cold conditions. The FICM was used on all Duramax engines from 2001 to 2005. The 2006 and newer model-year engines do not use a FICM. Originally the FICM was necessary to provide the high drive voltages and current necessary to operate the fuel injectors. The LB7 injectors need a trigger of about 93 volts at 18 amps to initiate injection, with a high current load of 12 amps to sustain injection. The electronics necessary to do this required additional cooling, this is the reason why fuel is routed through the FICM. The FICM communicates diagnostic information to the ECM with a dedicated communication bus, a two-wire system known as a Controller Area Network bus (CAN-bus). The ECM has dedicated wires for each injector and it pulses those wires to indicate to the FICM when it wants a specific injector to trigger. Common service issues of the FICM result primarily from wire harness chaffing around the harness support brackets. This can cause various injector DTCs to set along with a rough running engine. The potential for this problem can be alleviated by simply removing the tie strap that holds down the wire harness to the bracket and repairing the wire. On rare occasions, the FICM can start to leak fuel through the harness connectors. This will generally manifest itself as a no-start condition, as the vacuum in the fuel system draws air through the connectors and creates air pockets in the fuel. In the next step of the process, fuel arrives at the fuel filter manager assembly. There are two electrical components here. The first is a fuel heater which engages when fuel temperatures fall below about 60ºF. The second is a water-in-fuel sensor located at the bottom of the fuel filter itself. The assembly also houses the primer pump and primer bleed that allows priming of the fuel filter assembly. GM initially did not provide consistent information about exactly when the filters should be replaced, but now they always recommend changing the fuel filter every 15,000 miles and draining the water separator every oil change. On 2005 and newer trucks, there is a fuel filter life monitor that more accurately predicts fuel filter life as it takes into account total fuel flow through the filter assembly, which can vary greatly depending on the trucks usage. I replace my fuel filter according to this monitor instead of the 15,000 mile interval. New fuel filters are provided with new seal o-rings. Always install new o-rings, that will help keep the fuel filter airtight and prevent air leaking into the fuel system. Due to the supply pump being located farther along in the fuel system, the fuel filter is still under vacuum. When replacing the filter there is no need to pour fuel into the fuel filter. In fact, pouring fuel into the filter can introduce tiny contaminants into the fuel system. The primer pump provided will do the same job but it fills the filter from the feed side, allowing all fuel on the engine side to be cleaned by the element. Simply loosen the plastic primer bleed on the top of the assembly and press the primer pump several times to fill the fuel filter with diesel fuel. Once primed, I tighten the bleed screw – carefully because it is plastic and pump a few more times until the primer becomes more difficult to depress. This will ensure a clean engine start after replacing the fuel filter. There are a several service issues that can arise with the fuel filter assembly. One of the more common causes for no-starts is an air leak around the top seal of the fuel filter. Typically this is caused by the fuel filter not being tight enough, or small bits of foreign material between the filter o-ring and the housing surface. One quick way to isolate a potential air leak at the filter is to pump the primer several times and then see if there is any fuel leaking out of the filter seals: this works because the primer pump puts the housing under positive pressure up to 10 PSI. A second issue that comes up is the water-in-fuel sensor. This sensor is located at the bottom of the fuel filter assembly and has a simple float that will stay on top of any coalesced water in the bottom of the fuel filter assembly. The problem is that this system is not particularly reliable. Normally, if the water-in-fuel light comes on, there has already been too much water pass through the filter: causing damage to the fuel injectors. If you pick up bad fuel somewhere, especially if your fuel filter has been on for longer than the specified fuel filter replacement interval, water contamination can be drawn through the filter before it has had a chance to coalesce at the bottom of the filter housing and turn the water-in-fuel light on. This is one reason why secondary fuel filter assemblies, which provide an extra water separator in the system, are very popular. Getting a batch of bad fuel is extraordinarily rare when you refuel at higher-volume fuel stations. Fuel additives that contain some form of alcohol emulsifier will also defeat the water-in-fuel sensor because they suspend the water in the fuel and do not allow it to settle at the bottom of the separator. In fact, these additives can entirely defeat the action of a water separator itself, which is why GM engineers very strongly recommend against using them. In my personal opinion, the use of fuel additives in the Duramax is not necessary. I have never run any fuel additives of any kind in my LLY Duramax and at 100,000-plus miles there is no trace of any kind of fuel injector problems. Change the fuel filter every 15,000 miles and drain the water separator at every oil change, run fuel from high-volume sources like truckstops and you will likely never have a problem with fuel injectors. That is with the exception of the LB7 Duramax engines that sometimes suffered from ball-seat erosion problems with the early fuel injectors. A third issue arises from the fuel filter itself. Some aftermarket filters are not up to the specification that is needed to keep the fuel flowing to the injectors clean. The newest OEM filters, under the ACDelco brand, are dual-layer, five-micron filters. They are expensive (in Canada they retail at $105.00 each) but they work well, are trustworthy and will protect your warranty. Having said that, GM sources their Duramax fuel filters from Racor-Parker, if you are looking for a potentially more economical alternative. If the fuel filter is left on the truck too long or the filter has been plugged with contaminated fuel, a trouble code can set resulting in limp mode. Typically the DTCs that set are P1093 or P0093 depending on the generation of Duramax. Another DTC that can set in extreme circumstances is P0087. Fuel filtration is critical to the life of the Duramax fuel system. The importance of keeping up with the fuel filter change interval of 15,000 miles and draining the water separator at every oil change cannot be overstated. From the fuel filter, fuel is drawn to the fuel injection pump assembly. There are in fact two pumps in this assembly, a low pressure supply pump and a high pressure fuel injection pump. The supply pump draws fuel from the fuel tank under vacuum. As mentioned before, there is no frame or tank mounted lift pump. With the exception of very high-performance applications, there is no need to add a separate lift pump. Some aftermarket companies market lift pumps with air bleed devices to remove aeration in the fuel. This is also unnecessary because the injection pump already has internal bleeds to remove tiny air bubbles from the fuel. The injector pulsewidth – which is the length of time that the injector is activated. There is a limited window of time during which fuel can be injected into the combustion chamber. This window varies in relation to the speed of the engine: the higher the RPM, the smaller the window. During this brief period of time, fuel needs to be injected, atomized and combusted. At higher engine loads, larger quantities of fuel need to be injected in a shorter window. The only way to get enough fuel atomized for proper combustion at these high speeds is to increase the pressure of the fuel flowing through the injectors. The ECM takes into account engine RPM and desired fuel rate to determine the required fuel rail pressure. The high pressure portion of the pump is a radial three-piston, cam operated unit that requires about one-ninth of the operational torque of the conventional distributor-style injection pump common to the 6.5 diesels. This pump is capable of producing the extremely high pressures required to operate the fuel injectors. The early Duramax fuel pumps produced a maximum typical pressure of 23,200 PSI. The newer model (LBZ/LMM) fuel pumps produce 26,500 PSI. One commonly occurring service issue is a pressure regulator that sticks intermittently, usually when hot. The sticking action will normally cause an idle surge, with the idle fluctuating up and down by 50 to 100 RPM or so. In extreme cases the sticking regulator can cause the high-pressure blow-off valve to release, dropping the rail pressure suddenly and causing DTCs to set. Replacing the fuel pressure regulator remedies this issue. Occasionally, the high pressure pump fails. A failure of the high-pressure pump is usually quite evident as one of the plugs on the piston feed chambers will get knocked out, causing prodigious quantities of diesel fuel to run down the engine valley to the back of the engine. Even with this kind of failure, it may still be possible to start the engine. This injection pump is generally quite tough. I have seen injection pumps survive major water or gasoline ingestion and still operate flawlessly for years after. High-pressure fuel exits the injection pump and then feeds both common fuel rails. Two other major components are involved, either mounted on the fuel rails or on a separate block depending on the generation of Duramax. These are the fuel pressure sensor and the high-pressure relief valve. The high pressure relief is there to release fuel in the event of a failure that causes an extremely high-pressure spike. Typically this is calibrated to release at roughly 3000 PSI over the maximum normal operating diesel fuel system pressure. The fuel pressure sensor provides direct feedback to the ECM so that the ECM can properly modulate the fuel pressure regulator and so the overall system pressure. Again, it is either mounted in a distribution block or in the back of one fuel rail in the later Duramax engines. The fuel rails themselves serve as a distribution point to deliver high-pressure fuel to the individual injectors. These are large enough to be accumulators and allow for the fuel pulsations as the injectors cycle There is one fuel rail for each bank of injectors. Normally, the fuel pressure sensor is quite reliable. However on the very early LB7 Duramax engines, these sensors were known to leak. Simply re-torquing the sensor usually alleviated the problem. The high-pressure relief valve is a common failure point on the LLY Duramax, apparently affected by heat. They will allow the fuel pressure to drop dramatically, with a corresponding drop in power and then a low-rail pressure DTC like P1093 will normally set. Probably because of the early Duramax LB7 injector issues I mentioned at the start of this article, the fuel injectors are by far the component that causes the most concern among vehicle owners. However, the Bosch fuel injectors produced from the LLY to present have been rather bulletproof. The only way a customer will experience mass problems with the modern external-type fuel injectors is to flood them with contaminated fuel. Even under those circumstances, I have seen some injectors survive the abuse when it was detected early enough. Fuel contamination issues can be manifest by a rough-running engine, white or grey smoke, or fuel knock. If the engine is shut down the moment any of these symptoms start to occur, there is a chance that most or all of the injectors can be recovered by simply purging the fuel system and replacing the fuel filter. If the truck is mistakenly fueled with gasoline and run for a while, the fuel injectors on LLY and newer engines will generally survive just fine if it is shut down when the symptoms become manifest. The fuel injectors themselves are electrically triggered and hydraulically actuated. They receive a constant supply of high-pressure diesel fuel from the fuel rails and piping. The need for a distribution pump providing each injector with a timed shot of fuel (as required by the older diesel fuel systems) is gone. On the early LB7 Duramax, high voltage was required to initially fire and keep the fuel injector solenoid active: this voltage was provided by the FICM. On the newer LBZs, the fuel injectors run with a much lower voltage and current requirement, allowing the Bosch ECM to perform the duties that once needed the separate FICM. Partially disassembled view showing fuel injection pump and fuel rail. This is an LLY engine, others are similar. A. Fuel feed line; B. Fuel pressure regulator; C. Fuel injection pump assembly; D. High pressure fuel line from injection pump to fuel rails; E. Passenger side fuel rails (Feeds fuel injectors 1, 3, 5 and 7); F. Fuel rail pressure sensor; G. Fuel return line. When fuel enters the fuel injectors, it pressurizes two sides of a piston with a spring on one end. When the solenoid energizes, it lifts a tiny pintle and allows a small check-ball to come off its seat located on the top portion of the piston chamber. This creates a drop in fuel pressure on the top of the piston, allowing fuel pressure below the piston to drive the piston upwards. This in turn allows the injector needle to rise with the piston and fuel to exit the tiny nozzles at the bottom of the injector. Due to the incredibly high pressures involved, the delivery holes in the nozzle are very tiny indeed. There are six or seven holes distributed radially in the nozzle and each hole that I measured with a magnifier and graduated gauge is roughly three-thousandths of an inch in diameter. Consider that at maximum fuel rate, approximately 100 cubic millimeters of fuel exits the nozzle in less than 1.5 milliseconds! Because of the extreme pressures and the high rate of injection through micro-sized nozzles, fuel atomization is dramatically improved over older diesel injection systems. Fuel delivery from these injectors more resembles a fog than the stream of fuel that older injectors provided. Duramax fuel injectors were fast in the LB7s and are getting faster with each new version. This precision and speed has allowed complex pilot injection strategies to be employed to further improve emissions, fuel economy and to reduce engine noise. 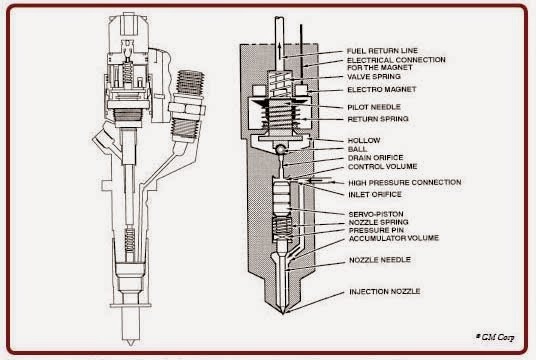 In basic terms, pilot injection injects a small quantity of fuel into the cylinder long before piston top-dead-center. It allows a small pre-flame to initiate. When the piston approaches top-dead-center, the main injection event uses the pre-flame to its advantage, allowing the fuel to combust at a more controlled rate. Without pilot injection, the larger puddles of fuel tend to light off suddenly at high temperatures, causing the pronounced knock that diesels are known for. Note the check ball and servo piston which operates the needle. As these injectors are hydraulically actuated, there is a certain minimum fuel pressure that must exist for them to operate. A healthy Duramax injector will begin working at 1000 PSI. This highlights a major service issue on the early Duramax engines – a no start condition brought on by an excessive high-pressure side fuel leak. One of the problems that plagued early injectors was a ball-seat leak. The check ball that released fuel above the piston would leak fuel between the ball and seat, causing the injector to leak far more fuel to the fuel return than if it was normally seated. That leak, especially if more than one injector was affected, would increase the demand for the fuel injection pump to provide high pressure fuel flow. At cranking speeds, there is a good chance the high-pressure fuel pump just could not overcome the size of this leak, causing a no-start condition as the injectors simply could not operate without enough fuel pressure. A common issue with the 2004.5-05 LLY Duramax was an electrical one. The terminals on the #2 and #7 injector connectors would brake down, causing fretting and an electrical resistance. The FICM would detect this problem and set several trouble codes and put the truck in limp mode, running on four cylinders. The solution is to replace both the #2 and #7 injector harness connectors with an updated harness kit from GM which includes harness support brackets and 90-degree connectors for these injectors. If you are a long way from home or need to get the truck somewhere for repairs, you could try spraying WD-40 into the ends of the connectors and tweak them with a safety pin to get the truck home. 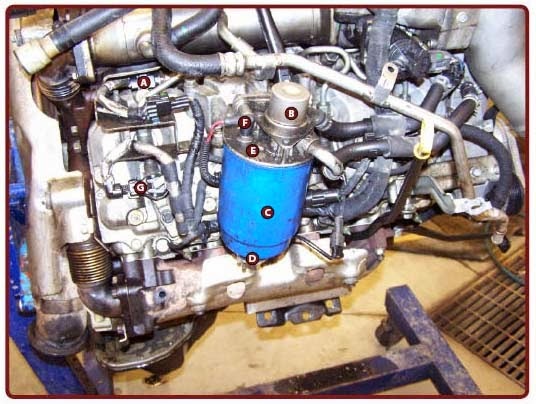 Other issues arise when any of the components within the injector bind or stick. A sticking piston and needle will cause wild amounts of white or black smoke and noise when the injector dumps far more fuel than that cylinder can handle. Poor atomization at the nozzle end can also be evident by a white/blue smoke at idle with the engine warm, going away when the engine is under load. Misfires, smoke, fuel knock, hard or no start conditions and fuel contaminated engine oil can all be brought on by an injector failure. These kinds of failures typically require special tools to diagnose accurately and will be covered in much more detail in further articles. Fuel leaks are a natural part of life in the fast lane of any high-pressure diesel fuel system. The injection pump has a certain amount of leak-by fuel that must be dealt with by the system. Likewise the injectors, even when they are not actuated, will leak a very small quantity of fuel internally. This fuel also has to be captured by the fuel system and returned to the tank. These jobs fall to the fuel return system which is simply a network of hoses that bring fuel back to the fuel sender assembly in the fuel tank. The fuel cooler, located just in front of the fuel tank, may seem like an unnecessary component. However, anytime fuel has been brought up to very high pressures, up to 26,500 psi in some models, heating occurs. There is also friction-produced heat from the injection pump and injectors that must be shed. If the fuel gets too hot, it looses its viscosity and becomes very hard to pump or control. Remember, a small increase in internal component leakage caused by thinner fuel can create several different problems, the most obvious being a no-start condition. It is important to keep the fuel cooler clear of obstructions, especially in hotter climates. A fuel temperature sensor, located in the fuel return plumbing on the engine, provides feedback to the ECM. These data allow the ECM to modify its fuel pressure and injection strategies based on fuel temperature. It will also detect a fuel over-temperature condition. As already mentioned, the Fuel Cooler needs to be kept clean and free from obstructions to operate properly. Otherwise, very few service issues arise with this system other than damage by foreign objects that will cause fuel leaks. The brains of the operation is the ECM. It reads input from a whole gambit of sensors and makes decisions as to when to trigger the fuel injectors as well as the duration and fuel pressure of the injector pulse which determines exactly how much fuel enters the cylinder. From 2001 to 2005 it triggered the injectors via the FICM. On 2006 to 2009 models the ECM triggers the injectors directly. It also operates and monitors various other engine management and emissions components like the turbocharger, the EGR valve, the fuel pressure regulator, the glow plugs and so on. The Transmission Control Module (TCM) also communicates with the ECM in order to request de-fueling when the Allison transmission shifts gears. Very few problems occur with the ECM hardware, although several issues have been taken care of by software program updates over the years. On the 2006 and 2007 classic body-style trucks, a common wire abrasion issue very near the ECM can cause problems. The ECM harness can chafe on the driver’s side fender liner, causing wires to rub through or corrode. Usually, an uncommon DTC will set in the ECM or a strange driveability problem will crop up. The solution is to repair the wiring and to relocate it so that it does not rub on the fender liner. We have just got into the basics of the operation of the Duramax fuel system. There is much more going in the Duramax than earlier diesel fuel systems, with some innovative and intricate engineering. Older mechanical injection pumps contained a simple throttle cam that adjusted fuel quantity and an RPM governed mechanical advance cam. The Duramax has electrically triggered injectors where pulsewidth and timing are decisions made by the ECM, with many sensors providing input and complex algorithms and tables stored within the ECM. The ECM also performs several diagnostic functions. That changes the dynamics of diagnosis and repair considerably over conventional diesels. I remember an older technician telling me that when he started to see electrical wires coming out of carburetors, that it was time for him to quit the trade. That was back in the early 1980’s when gasoline fuel systems were starting to transition into electronic controls. First they controlled solenoids within the carburetor and then they advanced into full electronic controlled fuel injection systems. Some technicians and most owners were left behind as technology advanced. We have seen a very similar transition in the GM diesel world, only years later. First, GM started putting electronic controls into what was normally a mechanical diesel distributor injection pump with the 6.5 diesel in 1994. Many owners were a bit lost with that system and a few technicians too. Then they progressed into a fully electronically controlled common-rail diesel fuel injection system in 2001 with the Duramax. Historically, this move really did leave behind the diesel techs who were not motivated to progress with technology. In the here and now, to be a competent diesel fuel systems specialist, you need a good understanding of the basics of electronic engine controls. Now if the Duramax left behind some technicians, what about the owners? Most Duramax owners will still likely take the hard problems to a technician who knows what he is doing. However, armed with proper tools, some service resources and general knowledge, owners can still diagnose some basic or common problems and do the repair themselves. That is what this series of articles is designed to do – to help the owners take control and gain a bit of knowledge as to what is going on with their Duramax. Even if you choose to take your Duramax to a technician, these articles will help you better understand the problem and the solution. Hopefully, you are now armed with effective knowledge of the basics of the Duramax fuel systems operation and some of the service issues involved. Excellent article! Thanks for taking the time to write and share!